Venum has established itself as one of the better known gear companies in the martial arts world with flashy graphics and trendy logos on their products. They can offer you clothing, heavy bags, and all sorts of gear to outfit yourself in. A newer addition to Venum’s offerings is the Kontact EVO line. Unlike some of their other products that come with neon colors and bold graphics; the Kontact EVO line is toned down, and offered only in black with basic logos. 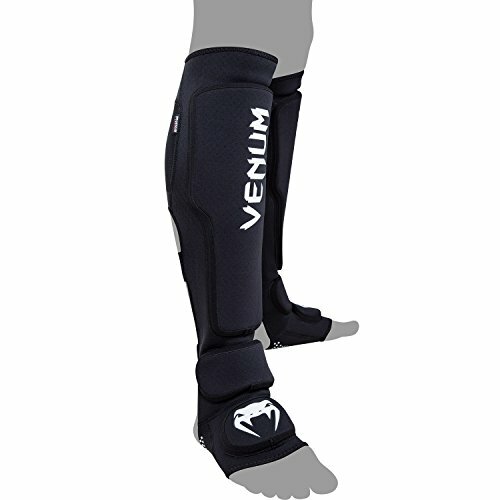 Venum offers 4 Kontact EVO products including knee pads, foot grips, ear guards, and shin guards. It is clear Venum has a mindset with this line to offer protection smaller, lighter, and thinner, to do the protecting without getting in the way or being able to direct traffic with it. The fit and finish of these shin guards is good, they are on par with the quality that Venum has established over the years, the pad material is thin, dense, vented, and there are three of them per leg. There is a round pad that protects the top of the foot; another protects the front of your ankle at the bend, and the main shin pad that goes from the ankle to right below the knee cap. The elastic strap below the knee is attached to a mesh section around back that holds your calf, two elastic straps are below that, and on bottom there is a nice gripping section from in front of the heel to right at the ball of your foot, basically if you buy these shin guards, all the features found on the Kontact EVO foot grips are built in. The overall construction feels like neoprene. The official fabric content according to the tag is 20% Nylon, 60% SBR, and 20% EVA. The first class I broke these out in, I got a few looks and some inquiries about how hard I planned on kicking with my new ‘knee socks’. I assured my partners I had no plans of hurting anybody and I expected the same courtesy with checks of my 50% power kicks. As other guys were adjusting their hook and loop shin guards or trying to wiggle their way into the elastic backed guards, I slid mine on and bounced around. Moving around with these is a nice feeling, no feeling of medieval armor on my legs, nothing digging in or squeezing too hard. About the time I was thinking of how good these shin guards felt my partner loaded up on a kick to the inside of my lead leg. As always (if I’m quick enough) I lift my leg up and shielded the kick with my shin. Did I feel it? Yes. Did it cause any pain? No. The truth is, if your partner has shin guards on and you do too, these Venum Kontact EVO guards aren’t going to hurt you in the case of shin on shin contact, even if you are going hard, providing your shins are ‘conditioned’ to some trauma. The point of an elbow or knee is a different story, however. That is exactly where these shin guards can’t make up for the fact that they aren’t leather stretched tight over molded foam. On one careless occasion, I caught a pointed knee on the shin while wearing these shin guards. That resulted in me hopping around and letting out a creative string of curse words, none of which were directed at Venum’s Kontact EVO shin guards because if I was in a position to get my kick checked in such a way, then I deserved it! I did not receive any complaints about my kicks hurting more than normal, I think that is in part due to the soft construction as it compresses on impact. Can you get a sore spot on your shin from your sparring partner’s knees and elbows with these shin guards? Absolutely. Can you sneak kicks in places that bigger traditional shin guards can’t fit? Absolutely. Can you fold them in half and toss them in a bag, then throw them in the washing machine? Yes you can. I recall the second installment of ‘The Dark Knight’ movie when Bruce Wayne has some adjustments made to his armor to allow him more movement, but he sacrificed some protection in the quest for this. That is the story of these shin guards, although I think it’s overall a good thing for an experienced and controlled practitioner. Venum has created a different category of shin guards with the Kontact EVO. They are unlike any other shin guard that is offered by any gear company. The Kontact EVO shin gaurds are in fact washable and fit nicely into a gear bag, even better than cloth shin guards. They form snug to your leg, they don’t move around, they breathe nicely, and offer movement like no other. I have owned the Venum Kontact EVO shin guards for 3 months, they have seen over 30 rounds of sparring and several machine washes. They are holding up well, no cracks in the graphics, no stretching, and no pilling or balling up of the fabric. Every few uses I throw them in the washing machine on cold, with other clothes, dry them for a few minutes and let them air dry the rest of the way. The Venum Kontact EVO shin guards are my favorite pair, I use them almost exclusively to spar with. The positives far outweigh the negatives, as I’d rather be able to move and strike accurately than have a level of protection that is unnatural in a non-training environment. I would not however, recommend these to a new student or someone who has trouble controlling where their kicks land. The bottom line is these shin guards are as close as you can get to moving and striking without anything and still have a decent level of protection. Greg purchased this pair of Venum Kontact Evo himself for the full price. This did not influence the outcome of this review.